Last year for Christmas, Richard and I spent a month traveling (side note – am I the only one who always tries to spell this travelling?) around the UK. We spent time in England, Northern Ireland, Wales, and even drove through Scotland (albeit without stopping) while visiting his family! For some reason, one of the things we remember most is getting stuck in the wind and rain outside of our hotel beside the Giant’s Causeway after a fire broke out. Not exactly the most fun we’ve had, but the reward was worth it! We were in the middle of a wonderful breakfast at the hotel, when one of the dryers in the laundry caught fire, and we were told we had to go outside right away. Unfortunately it was in the middle of December, and of course we forgot to wear our winter coats to the dining room. After freezing outside for a while, we were brought into the nearby visitor center to wait until the firemen cleared the building. Luckily nothing was damaged. Sorry, this post is kind of light on the photos (even though I brought my camera with me)! Side Note – Does anyone else feel super awkward and embarrassed taking photos? It’s something I am working on, as I often look back and wish I had taken more photos… hopefully this blog can help me get over that! As Richard often reminds me “you are a tourist” – so I need to stop worrying about looking like one. Last weekend was Richard’s birthday! I had asked the head baker at work if I could have that day off, and not only did he agree, but he offered to rig the schedule and give me a four day weekend!! The one thing Richard kept saying he wanted for his birthday, was to go home (to Northern Ireland). His sister Katherine still lives not too far from where he grew up, and he wanted to visit her and her husband, as well as see his wee nephew (who is growing so fast!). A few years back, in my first apartment, I made a large gallery wall using IKEA RIBBA black frames, and black and white photos. It was modern and striking – which suited my industrial-loft style apartment. In my last place, I switched to all white frames with colourful photographs and artwork. Still a gallery wall (bigger too) but again, using IKEA RIBBA frames. While I do look back on them fondly, there’s something too simple about the way they looked now. They never quite matched my eclectic style, and felt too much like I was copying someone else’s aesthetic. I’m pretty sure that Richard would agree, I spend waaaay too much time on my phone, browsing stores. It’s not like I have the money to buy any of the things, but I often find myself saving pages and items for some mythical-future-influx-of-cash. I figured that since I’m not going to buy any of these items anytime soon, perhaps I should share them with the world, and someone else might give them a good home. First up we have Anthropologie – oh how I love thee! I can’t help but stop in their stores every chance I get. Great stuff and such inspiring window displays! Who doesn’t like a man who can cook? One of the best things about Richard is that he not only enjoys cooking, but is quite good at it too! Since I am a baker by trade, he told me that he won’t bother trying to get really good at baking/breads/etc. – that’s my thing. But he does want to have something that he’s better at than me, something that our future kids will request (“dad’s —-“). To that end, he has decided he will work on being the best at Asian cuisine. Right now, he’s focusing on Indian curries, and bought the cookbook Rick Stein’s India. You should have seen how excited he was when it arrived! It’s a really great cookbook, full of truly authentic dishes. The best part is that it’s not like recipes you find online, where you’re using store bought pastes or spice mixes – this book has you grinding cardamom pods, making your own coconut cream, etc. 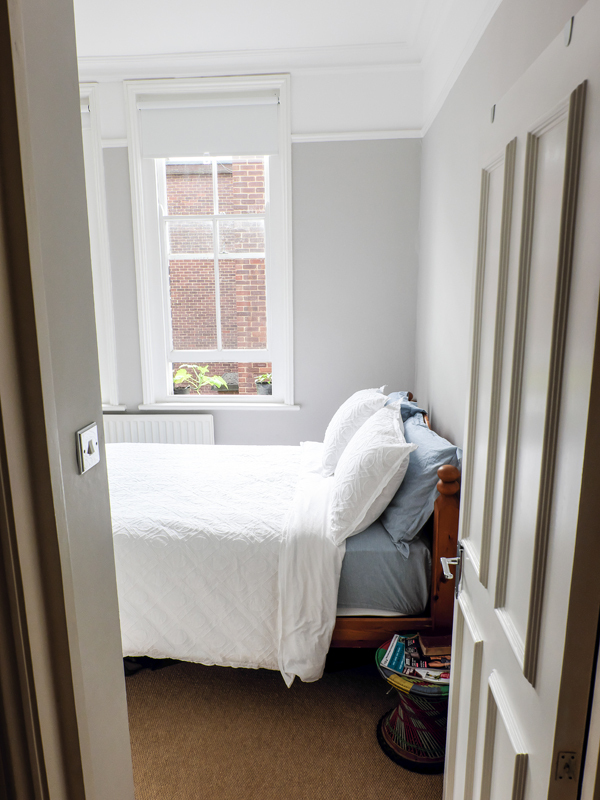 There are a few rooms in our flat where I know exactly what I want to do – the two most solidified in my mind are the hallway, and the bedroom. The hallway is easy to figure out because it’s such a small space. Add a single piece of furniture, some artwork, a mirror, a few accessories…. and bam! Done!